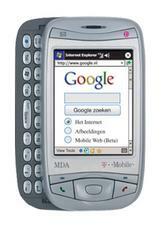 T-Mobile Germany announced the successor to the MDA III, the MDA Vario. The device is based off the HTC Wizard and should cost less than the MDA III. The MDA Vario is expected to begin shipping this year though T-Mobile has not confirmed this. While the Vario is a quad-band GSM device, we haven't heard that it will come to the US. The HTC Wizard has been approved by the FCC though, so it's possible.